The first paragraph of section 4 of the Partnership Act defines partnership as a relation between persons who have agreed to share the profits of a business carried on by all or any of them acting for all. Partnership is thus neither a contract nor an agreement but is merely a relation between persons how have entered into an agreement. The question whether certain persons are partners in the legal sense depends upon the legal relations proved. Whether there is a partnership and whether a person’s is or not a partner therein is a question of fact which has to be determined with regard to the relationship between the parties as shown by all relevant facts taken together. The existence of a business is a sine qua non of a partnership. 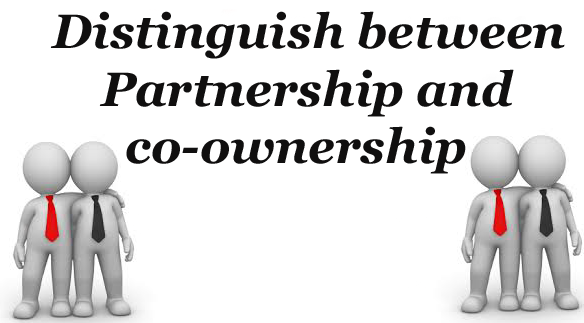 Mere co-ownership of property does not amount to partnership though when utilized in business it may become partnership property. Therefore the distinction between co-owners and partners is that in the case of a co-ownership the co-owners do not intend to carry on a business still less do they intend to share the profits realized. On the other hand, in case of a partnership concern, the partners intend to carry on business with money or property which belongs to both of them. They intend to realize profits and share the same. Where property belonging to two Muslim brothers was sold by them and the sale proceeds were invested in a running business which was to be carried on by both of them. It was held that they were partners. To constitute a partnership there must be an agreement between the parties; where no agreement between co-owners as to the property they own. Such agreement may be express or implied. The mere fact that the legatees or domes under a will or a deed inter vivo, as the case may be, or heirs at law, happen to have common interest in some business which is divisible amongst them would not make them partners. But, if such persons continue the business either after the death of the testator or when the inheritance falls on them. As the case may be, it could not be postulated that there was no partnership. When the business is continued, there is an implied agreement amongst the various individuals having a common interest in the business. 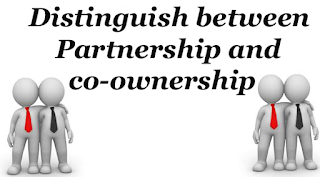 The essential distinction between co-ownership and partnership is that, in a partnership, each partner is not only the principle but also an agent, whereas among co-owners each is the owner of his share. In a partnership, a partner cannot alienate his share without the onset of the other partners, whereas among co-owner, a co-owner can alienate his share, which is binding on the other co-owners. Co-owner does not, of itself, create a partnership as to anything so owned even though the owners agree to share any profits made by the use thereof; it is necessary that there should be consent of all to trade as partners before there can be a partnership. Part owners who divide what is obtained by the use or the employment of the thing owned are not thereby constituted partners. A partnership is a result of agreement. Co-ownership is not necessarily the result of agreement. It is generally created by the operation of law. A partner is an agent of the firm. He can bind the other partners for his acts. The co-owner is not an agent of the business. He cannot bind the other co-owners for his acts. A partner has a lien on the property of partnership. A co-owner has no lien on the joint property of his co-owners. A partner cannot transfer his share without the consent of all the partners. But a co-owner can transfer his interest or share in the property without the consent of others. In partnership there is a common interest. But in co-ownership there is no common interest. A partnership is always made to carry on a business, Nut co-ownership does not necessary invlve the carrying on of a business. A partner cannot demand a division of the property. But co-owners can demand the division of the joint property. If a partner spends some amount from his own pocket for the firm, he has a legal right to get the amount of expenditure reimbursed. But a co-owner has no legal right to claims reimbursement unless other co-owners agree for that. Partnership is regulated by the partnership Act, 1932. But there is no separate law to regulate co-ownership.